Our most popular Basslines pickup. High output, versatile, pickup. Recommended for blues, classic rock, punk, heavy rock, classic metal and nu-metal. The quarter-inch diameter pole pieces expand the magnetic field and extend the frequency ranges for fat, full, punchy sound with tremendous mid-range presence and maximum output. 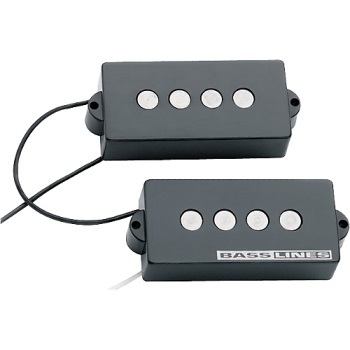 Though often used for heavy rock tones, this pickup gives amazing tonal versatility to a single pickup instrument making this the most popular Basslines pickup. Includes logo covers. Often used together with STC-3M3 and -3M4 Tone Circuits for optimal tonal control. For warmer toned ash, alder or basswood body instruments. Works especially well with rosewood fingerboards.